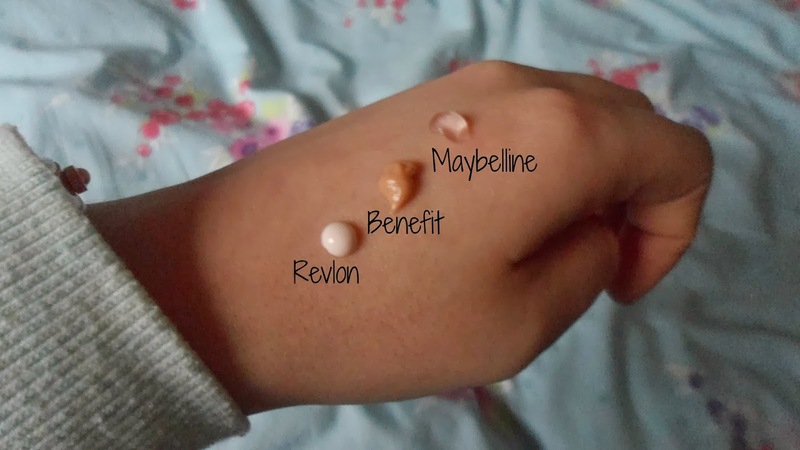 Beautiful You: Lets Talk Primers | Benefit, Maybelline and Revlon! Lets Talk Primers | Benefit, Maybelline and Revlon! I have always been one for being lazy when it comes to primers but recently my makeup hasn't been lasting as long as I would like it to so I thought that I would go on a hunt to find a good one! All of the products are from the drug store but some are slightly more expensive than others, but there is a range so at least one should suit everyone! I bought this primer with so much hope because I had heard so many good reviews but I just can't lie to you, I really haven't been impressed. I don't know if it is just me because I have quite oily skin at times but this just exaggerated that and I just couldn't control the shine which is never good! The formula of it is quite slippery and gel consistency and although it is easy to apply; I don't find that it sinks into the skin that well and then when you apply your make-up over the top, it just slides off! I really hate giving this a bad review because I was so excited about it but I am being honest and I don't think its worth buying, sorry! Everyone loves this primer and I am no different! It evens out your skin tone, leaves the skin feeling flawless even without foundation and reduces the appearance of pores, what more can you want? My make-up lasts insanely well when I use this primer and I wish I could use it all the time but I simply couldn't afford that on my student budget. However, if you are looking for a product to help your make-up stay on a night out or when you know you are going to be doing a lot, this is definitely my go to! I have been using this primer so much recently, basically everyday and I love it. It is really moisturising in my opinion and even when applied on its own it looks really good. It evens out my skin tone as I have slight bit of hyper-pigmentation on my cheeks and it clear that issue up right away. It is so easy to apply and it creates a smooth basis on which to apply your foundation. I find that this makes my make-up last a very long time, even if I have been out by the beach where it is windy or I have been hot and so on. I love this primer and although the price tag is slightly steep at £11.99 you really do get your money's worth! Those are the primers I have been loving, or not so much recently, let me know if you have any other opinions or other primers that I should try out because I am always looking for more! Have any of you tried Maybelline Baby Face Primer, did you like it? Let me know in the comments! My giveaway is also only open for another 4 days so you better get your entries in quick! I shall link it here for you so you can go and do that. Also don't forget to follow me on twitter so you will know who the winner is, for all you know it could be you! I am off to see my favourite band The Vamps tonight when they suppport The Wanted so I would say see you on Wednesday but I will see you tomorrow with a bonus post, keep your eyes peeled! I need the pore-fessional! Although I like the look of illamasqua's primer too. decisions, decisions! I really want the benefit primer! !